Selous Game Reserve is has a total area larger than Switzerland and the Game Reserve is four times larger than the Serengeti National Park. Currently Selous Game Reserve, is the largest protected wildlife area in Africa and the largest Game Reserve. 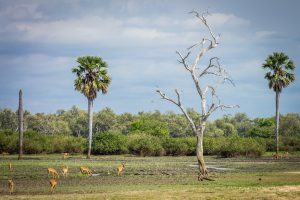 Not all of Selous is accessible because of no infrastructure and it is believed that there are some parts of the Game Reserve that no one has ever ventured in for safari. That is to the extent of a remote wildlife area that the Selous is. The Game Reserve was named after a British explorer and Conservationist who was named Frederick Courtney Selous who was also an accomplished hunter in those days. Selous was also a renowned author notably for his book named ‘A Hunter’s Wanderings in Africa’. Fredrick Selous died by the river banks of the Beho Beho River where he was also buried, near the Beho Beho Safari Camp. He was aged 60 when the First World War broke out and because he was known to be very conversant to the bush, he was made the Captain of the 25th Royal Fusiliers and he was the Commander in the chase after the German guerrilla army that occupied the Southern Parts of Tanzania at that time. Recent development in the area has made accessing Selous an easy affair. Until recently the roads were very impassable especially during the rains, but now Selous can almost be accessible throughout the year by road. Selous is also served by several flight companies but the most dominant and most reliable one has been Coastal Aviation which is however reputed for having pricey flights You can however trust that they will get you to Selous without any delay or sudden cancellation of flights. Other flights are operated by Zanair which operates flight also from and to Zanzibar Island from the Selous Game Reserve. Selous is also connected to other wildlife areas in the Southern Tanzania Safari Circuit by road but also by flights which fly to Ruaha for example. Currently the Selous Game Reserve Charges USD 50 per adult, and an extra USD 25 per adult as concession fee making it a total of USD 75 per adult. That is for all persons staying within the Park and the fees are charged for a duration of 24 hour basis. While staying outside where several camps have been set up in recent years the Selous Game Reserve charged at USD 50 for entry fees plus an extra USD 15 as Concession fees. As opposed to the parks in the North, Selous game reserves offers a variety of activities. Game drives are one of the activities that are done in the Selous, which means watching wildlife from the 4×4 safari vehicles. What makes Selous a unique destination however is the fact that boat safaris can be done in the Rufiji River and the several lakes that are in this area but also exploring the African bush by foot can be done in Selous; the Famous Walking Safaris in Selous. Walking is allowed mainly for persons who are of over 12 years of age though. Young children can always stay behind at the Camps while adults are doing the walks and the Boat Safaris. 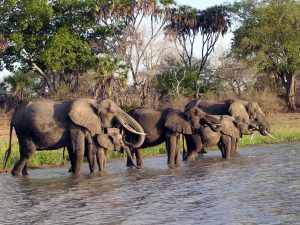 During the walks and boat safaris one expects to see the big game like buffaloes, elephants and sometimes lions but also the hippos and the Nile crocodiles. It is estimated that Selous harbors at least 4000 lions, more than 120,000 herds of Buffalo, more than 100,000 wildebeests and more than 40,000 hippos as well as lot of impalas, zebras, giraffes and hartebeests despite that hunting has been allowed by the government (Professional Hunting). The Game Reserve is also home to crocodiles, spotted hyenas, kudus nut also the rare species like the African Hunting Dog which is not easy to spot but still can be spotted with a little luck in Selous. The Selous is also a birders haven with more than 440 species having been spotted and recorded. Some of the birds that can spotted here includes the pink-backed pelicans, giant kingfishers, African skimmers, white-fronted bee-eaters, ibises, yellow-billed stork, malachite kingfishers, purple-crested turaco, Malagasy squacco heron, trumpeter hornbill, fish eagles and many other more. The Selous Game Reserve is now not short of places to stay in both inside and outside the Game Reserve. Many Camps have been set up, thanks to increased development and investment ventures that the area has experienced in the last decade. Selous has Top end luxury tented camps which are served by the Airstrips and the road network but a lot more camps have been established for the middle class traveler within and outside the boundaries but still offering clean, safe and affordable accommodation, to help you explore the untouched African wilderness in the South. Apart from a short safari to Selous Game Reserve alone as a single destination, we also offer various tailor made programs to Selous in combination with other parks in the south. This includes Mikumi National Park, Ruaha National Park and Udzungwa Mountains for those who fancy a hike in addition to the exploring the Selous and the Southern Tanzania.